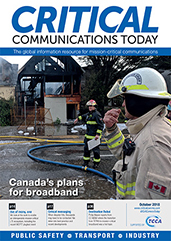 Critical Communications Today covers the global critical- and mission-critical market, with an emphasis on open standards-based wireless communications technologies . I wish to receive FREE copies of Critical Communications Today regularly. I do not wish to receive FREE copies of Critical Communications Today regularly.